To easily integrate into the household use, PLANET releases the POF (Plastic Optical Fiber)Web Smart Switch, FSD-624SF. With its easy installation and highly stable data transmission performance via Fast / Gigabit Ethernet, the FSD-624SF is an ideal device for Home fiber solution and FTTH (Fiber to the Home) applications. The FSD-624SF provides four 100Base-FX POF Fast Ethernet ports and two Gigabit Ethernet ports (one 1000Base-T port and one Gigabit mini-GBIC interface). Its fiber-optic interface is the form factor of SMI (Small Multimedia Interface), one kind of POF (Plastic Optic Fiber) interface that offers high-speed data transmission at a low cost. The two Gigabit ports either can be 1000Base-T for 10/100/1000Mbps or 1000Base-SX/LX through SFP (Small Factor Pluggable) interface. The transmission distance can be extended from 100 meters (TP), 550 meters (Multi-mode fiber), up to 10, 20 kilometers, max. 120 kilometers (Single-mode fiber). The FSD-624SF is equipped with non-blocking 4.8Gbps backplane, greatly simplifying the tasks of upgrading your LAN for catering to increasing bandwidth demands. To manage the switch efficiently, the FSD-624SF is equipped with Web interface for remote management. The FSD-624SF can be programmed for advanced switch management functions such as port configuration, port-based / IEEE 802.1Q / MTU VLAN, port mirroring, QoS, bandwidth control, broadcast storm control, MAC address / TCP & UDP filter and IGMP Snooping v1/v2. For VLAN features. Provided by the FSD-624SF, the VLAN groups allowed will be maximally up to 6 for port-based VLAN or 32 for IEEE 802.1Q VLAN. The MTU VLAN feature allows the administrator to assign per port as separate LAN group and only can access the public port G1 or public port G1/G2. 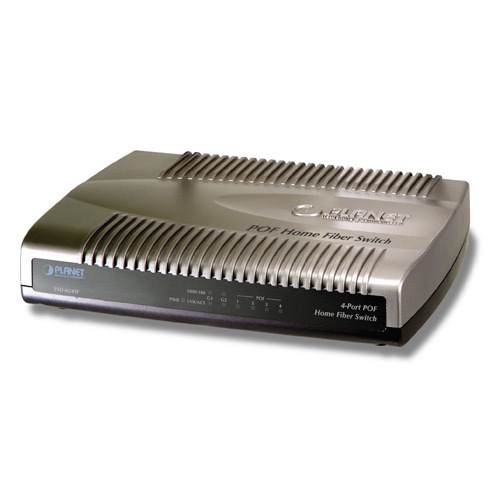 The 4 100Base-FX POF fiber interfaces support 100Mbps full-duplex operation mode (auto negotiation or force mode option). The SMI path cord meets the IEEE 1394b specification that can transmit data at S200 (250Mbps) speed for 50 meters. With its auto-negotiation capability, the 1000Base-T RJ-45 port of Web Smart Switch can be configured to speeds of 10/20Mbps or 100/200Mbps via Fast Ethernet, and 1000/2000Mbps via Gigabit Ethernet automatically. In addition, the FSD-624SF is equipped with the MDI / MDI-X auto detection for easy plug and play connection, regardless of cabling types in straight through or crossover. With four 100Base-FX POF ports and two Gigabit ports (One 1000Base-T copper and one Gigabit mini GBIC interface), the FSD-624SF can build a data and reliable network solution to FTTH (Fiber to the Home) or small office network environment.